What were you doing 8 years ago today? My day began as most did back then. Awakened by the soft cries from the baby monitor, I dragged myself out of bed and made my way upstairs to tend to my baby girl, just over a month old. With a full tummy and a clean diaper, she fell asleep in my arms and I enjoyed the few precious moments of quiet before my four year old boy came bounding down the stairs. My husband was enroute to the airport. He had reservations for a flight to California. A flight that would not take off that morning. By 7:00 a.m. CST, my son had eaten his breakfast and was watching Franklin the Turtle on Nick Jr.
A few minutes before 8:00 AM, the phone rang. I correctly assumed that it was my husband calling to check in. I watched in stunned silence as smoke poured out of the north tower of the World Trade Center. Moments later, still on the phone with my husband, my mind tried to compute what my eyes were seeing on the television screen. 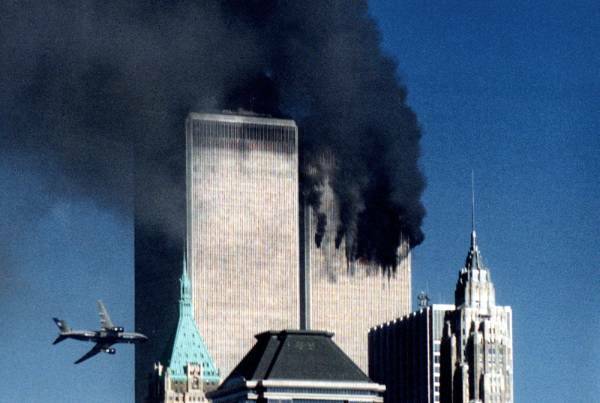 What I and millions of others were witnessing live on television was United Airlines Flight #175 crashing into the south tower of the World Trade Center. “What does this mean? What does this mean?!? 9:37 a.m. EST American Airlines Flight #77 strikes the Pentagon in Washington, D.C.
10:03 a.m. EST United Airlines Flight #93 crashes in a field near Shanksville, PA.
Where were you the day the world changed forever?